Here is an old and powerful story. There once was a boy who had a very bad temper. His Father gave him a bag of nails and told him that from now on, each time he lost his temper, he must hammer a nail into their beautiful white picket fence. The first day the boy drove in thirty-seven nails. 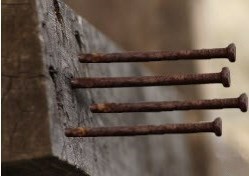 Over the next few weeks, he learned to control his anger -- the number of nails he hammered daily gradually dwindled down. He discovered it was easier to hold his temper than to go outside and drive those nails into the fence. When he told his father about this, he suggested that the boy now start pulling out a nail for each day that he was able to hold his temper. Finally, the day came when the young boy was able to tell his father that all the nails were gone. That evening, he took his son by the hand and led him to the fence. He said, "Son, you have done well but look at the holes you've made here. Our beautiful fence will never be the same. When you say things in anger to the people you love, they leave deep, ugly holes just like these. It won't matter how many times you say I'm sorry, the wound will still be there". This is a good reminder for us today. Our tongue is a powerful force! With it, we need to be bringing words of life and encouragement to those around us! Dear Lord, help us watch the things that we say. We pray that You will give us the power to tame our tongue. In the Name of Jesus, Amen.